The American coot (Fulica americana), also known as a mud hen, is a bird of the family Rallidae. Though commonly mistaken to be ducks, American coots belong to a distinct order. Unlike the webbed feet of ducks, coots have broad, lobed scales on their lower legs and toes that fold back with each step in order to facilitate walking on dry land. Coots live near water, typically inhabiting wetlands and open water bodies in North America. Groups of coots are called covers or rafts. The oldest known coot lived to be 22 years old. The American coot is a migratory bird that occupies most of North America. It lives in the Pacific and southwesternUnited States and Mexico year-round and occupies more northeastern regions during the summer breeding season. In the winter they can be found as far south as Panama.Coots generally build floating nests and lay 8–12 eggs per clutch. Females and males have similar appearances, but they can be distinguished during aggressive displays by the larger ruff (head plumage) on the male. American coots eat primarily algae and other aquatic plants but also animals (both vertebrates and invertebrates) when available. 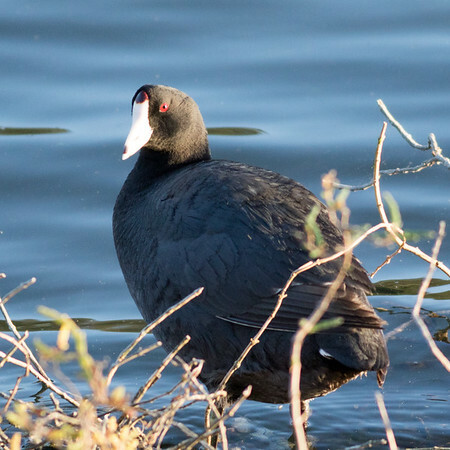 The American coot is listed as“Least Concern” under the IUCN conservation ratings. Hunters generally avoid killing American coots because their meat is not as sought after as that of ducks. Much research has been done on the breeding habits of American coots.Studies have found that mothers will preferentially feed offspring with the brightest plume feathers, a characteristic known as chick ornaments. American coots are also susceptible to conspecific brood parasitism and have evolved mechanisms to identify which offspring are theirs and which are from parasitic females.